A stop-loss is already a great tool to make sure you don’t accidentally lose too much money while margin trading. That is why a healthy profit risk strategy is very important. 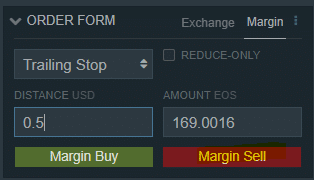 When you are in a Margin Long position your trailing stop will be a sell order. You set a sell order since you are selling the shares you bought at a lower price for a profit. When setting a trailing stop for a margin short position, your trailing stop will be a buy order. You are buying back the shares that you sold. The difference between the high share price and the low share price is your profit. There is a trailing stop order available for exchange trading. but this does not seem to “trail” Have i missed something or does this trailing stop function for exchange trading function differently? 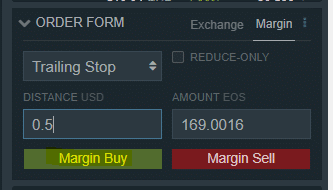 the trailing stop on bitfinex is only available for margin trading.